Fish fries are Southern party staples as well as great fundraisers. There are few weekends in the South where schools, politicians and churches don’t offer pre-ordered “plates to go” to help raise money for various projects, and the trend is migrating north. But that’s not to take away from the fun of a weekend gathering of family, friends and fried fish. No matter which way you go, it seems people can’t get enough fried fish. Fish fries include, of course, fish. They also generally include a second entrée. In the South, it could be a crawfish boil. In the Southwest, fish tacos might fit the bill. Or, consider offering fried chicken strips. Potato salad or cole slaw, baked beans or pinto beans, french fries and rolls round out the menu. Don't forget the hush puppies--they are a must. Also, plan to grill or bake some fish – just in case people won’t eat fried foods. Big pans of fruit cobbler make a great dessert. Get a good head count early on. The last thing you want is a freezer full of fish at the end of the day. 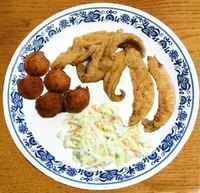 You’ll need between 25 and 30 pounds of catfish to feed about 100 people, according to recipesforacrowd.com. Also, decide how you’ll serve things. Buffet-style is a good way to go, although if the crawfish boil also is on tap, just rip of some end rolls of newspaper or butcher paper, slap them on the table and dump everything on the table. Enlist help. Put someone in charge of the potato salad or cole slaw and the baked or pinto beans. Layer potatoes and chopped vegetables in a bowl. Heat bacon drippings and combine with vinegar, pour over salad and toss. Add bacon, eggs, salt and pepper. Top with paprika. Serve hot or cold. Serves 6.